There are only two kinds of pilots, those who are still alive and well, and those who have gone off to – as I call it – fly with Lindbergh. It is with sadness I must report that Charlie Minkler has gone off to fly with Lindy. When I think about what a pilot who was born in 1907 has seen in their lifetime, it boggles my mind. In the same year that Santa delivered Charlie on this planet (yes, he was a Christmas baby) – a guy by the name of Ben Epps (see photo) was flying the very first airplane in the state of Georgia. This was only four years after the Wright's got the party started at Kitty Hawk, and airplanes were still nothing but sticks, wire and fabric. At about 10 years old – the official age when young boys fall in love with airplanes – Charlie might have dreamed about flying across the battlefields of Europe, chasing down the elusive Red Baron in World War 1. 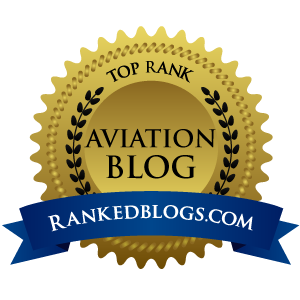 As a young man, Charlie watched commercial aviation evolve from Boeing biplanes hauling a few courageous souls sprawled out atop the mail bags, into silver eagles with two engines like the DC-3 which were capable of carrying people coast to coast. When he was into his 40's, he most likely was astonished when the Brits launched a new-fangled jet airliner called a DeHavilland Comet in 1949, considered to be the world's first commercial jet airliner. Charlie was two years from retirement age when the first Boeing 747 entered service. 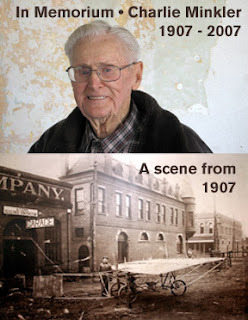 He spent his working years as a telegraph operator for the Santa Fe Railroad, along with minding the family general store in the microscopic town of Minkler, a “blink and you'll miss it” speck on the road to California's Sequoia National Park. He was never far from an airport or a cockpit throughout his adult life, and he developed a reputation as an adventurer without fear. 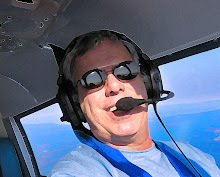 He finally gave in and actually earned a real pilot's license at age 72, and at an age when most men would be happy exploring a La-Z-Boy, Minkler immediate took off in a Cessna 150 on a solo trip...to the Arctic Circle! As is always the case with our senior pilots, Charlie lost his medical along the way, and was grounded...more or less. Rumor has it that he bought an ultralight to still “fly” but actually really only taxied it around Reedley Municipal Airport...a stone's throw from Minkler, which he called home his entire life. Somewhere along the way, he met up with a very likable lady pilot named Kathie McNamara. He and Kathie made trips around the world together, to Africa for a safari, or to Australia to explore the outback on a “fly it yourself” air tour. Kathie had a Cessna 150/150, and you can be certain that Charlie was almost permanently welded to the right seat. And at age 98, Charlie flew commercial down to Argentina to live out a lifelong dream of riding with the Gouchos. You've gotta love that! The last time I saw Charlie, it was 2003, and I was working hard to get my Welcome Sky Aviation Scholarship Program up and running. The program was simple...coax rich pilots to donate money, and then pay for flight training for the best and brightest 16-21 year olds we could find. It was a way to cultivate new pilots, to replace those who have lost their medicals. On that day, a torch was passed. As the career of one pilot was ending, another began. And now Charlie has gone off to fly forever with Lindy, Jimmy Doolittle and Papa Louie. And many years from now, I too will show up at that hangar party, and I'll enjoy a cold one with my dad before we all pile into Doolittle's solid gold Mitchell Bomber to go out for a joyride, burning up some of that endless AvGas we all know is waiting in Heaven.